Love the juxtaposition of the indoor furniture and the weeds! Like Andy without a Warhol outdoor still life. I am always amazed by the quality of your b&w pictures! Excellent! Boy of those chairs don't bring back school day memories! Looks like they've been out in the elements for awhile. Nice find. It would make a good place for timeout. Sit over there and make sure you don't stir up the rattlesnakes, Sammy. Really like this shot. 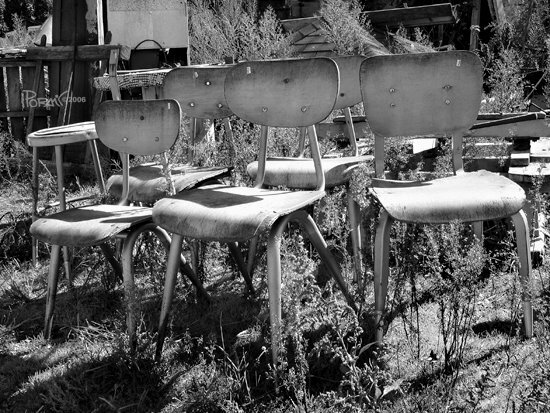 Nice B&W tones and nice juxtaposition of nature with the chairs. Very nice. Your B&W images are all wonderful. those are great, old school chairs. love the tones of this. the mixture of grass and metal is wonderful. cool shot. I have something like this too, but I dont know whether to upload it. Oh, I like this shot. Its gritty and makes me wonder what the story is behind the chairs. Great B & W.
Very interesting subject. It looks like a metaphor of people waiting to me. Lovely details, great shot as always! maybe Im just morbid but it puts me in the mind of a Horror flick..Whered all the students go ?? Looks very aged and eerie GREAT effect you achieved here! I really am fond of this prticular shot! I agree that there's a story here. Each of those chairs could tell us a story for sure. I like the shot a lot. Excellent composition and exposure, really nice shot! A new favorite on your blog! Love the contrast and abstract simplicity of this picture. Excellent! Wow, very cool shot! I like old objects. They have some kind of magic...Nice high contrast composition. home | about | my store | contact | blogger | flickr | fotothing | photoblog.org | blog explosion | bloglines | copyright © 2003–2014 poramit. all rights reserved.